After the loss of our Sean Seamour II between Cape Hatteras and Bermuda last May 7th I was in quandary to define what Sean Seamour III should be (see on this blog Final Log , en Français Le Récit). clean propulsion remains both her desire and my curiosity. cell electric drive as these energy generation technologies mature. and references on the state of the art and where it may be going. boat adventures where ever they may be. and installers, yards and craftsmen-mariners like us. L’Aventure BateauVert a pour objet de suivre et analyser les nouvelles technologies de propulsion et de la production et le stockage de l’énergie pour la navigation de plaisance et hauturière. La mise en œuvre de ces technologies sur le Nauticat 33 Sean Seamour III permettra une amélioration de notre environnement marin par des choix validées. The Greening of Sean Seamour III is a long term project designed to monitor and analyze new and emerging technologies important to bettering our environment and to help mariners and sailors who aspire to go green choose and implement the appropriate solutions. A Nauticat 33 is the test bed for maturing technologies sailing towards a future phase-out of fossil fuels. 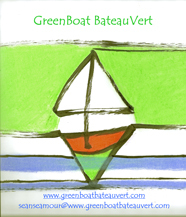 We invite you to join our crew of mariners from around the world who seek to make the sea a greener place to be.